People spend hours or even days looking for the perfect shade of paint for their home’s exterior. 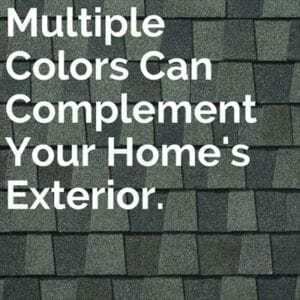 Yet many will spend merely a couple minutes deciding on the color of their roof shingles. There is a misconception that roof shingles have little to do with curb appeal. Though the entire roof cannot be seen from ground level, this does not mean the color of the shingles should be neglected. In reality, the appearance of shingles matters a great deal to prospective property buyers, neighbors and all those onlookers who pass by your home every day. It may be time for a roof remodel. Shingles that are the perfect color will complement your home’s shade of paint. Alternatively, shingles that do not jive with your home’s color will sabotage all the hard work and money that went into making the home look good. 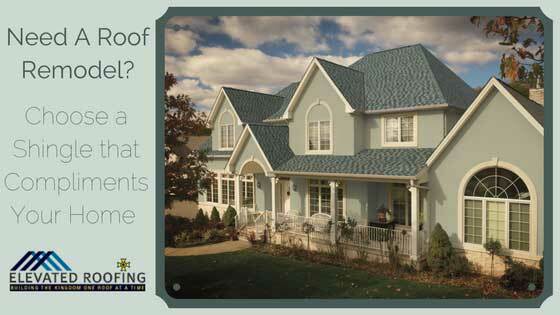 Think of your roofing shingles as the icing on the cake. Shingles should add that extra special touch that makes everything below that much more appealing. This is why you should carefully select the perfect color scheme when it is time for a roof remodel or a full replacement. Dark or Light Shingles? Roof Remodel. An all-white home is akin to a barren canvas. You can add shingles of just about any color. Consider factors such as how your home fits in within the context of the neighborhood, its architectural style etc. In general, it is ideal to pair a white-colored home with shingle colors like blue, green, black, grey and brown. If you are absolutely insistent on a “green” roof that reflects the heat, you can pair a white-colored home with white or beige shingles. This hue will reduce your utility bill and lower the odds of needing a roof remodel yet it will also make your home look plain. Your home’s bricks are there to stay. The shutter and paint colors can be changed whenever desired. Be extra cognizant of how potential shingle hues will jive with the bricks that comprise your home. Once you have settled on a handful of colors that work nicely with the brick, consider how those hues complement the siding and paint colors. There is no sense in adding shingles in a color that exactly matches that of your home’s brick or siding. Even a color that closely resembles the hue of your home’s siding or brick will prove quite boring. Inject some life into your home’s exterior by selecting a shingle color that truly complements the exterior. Such complementary colors provide your roof with the dimensions that appeal to prospective buyers, satisfies the neighbors and makes you proud of your roof remodel. Consider the Appearance of Roofing Shingles in Varying Environments and Conditions. A roofing shingle might look amazing beneath the light and less impressive in the shade. Your home is subjected to all sorts of different lighting based on cloud cover and other factors. Take a close look at each of your favorite roof shingles in varying shades of light. Ensure each of your home’s exterior hues complement the roof shingle in a wide variety of lighting conditions before making a commitment. You can’t live in your home forever. There will come a day when you must sell. If the shingle doesn’t complement the remainder of the home, it will decrease your property’s resale value. Take a moment to consider how potential home buyers will perceive your house. If the shingle you select seems flawed in any way from a buyer’s point of view, don’t add it!